Scrabble is a word game in which two to four players score points by placing tiles, each bearing a single letter, onto a gameboard which is divided into a 15x15 grid of squares. The tiles must form words which, in crossword fashion, flow left to right in rows or downwards in columns. The words must be defined in a standard dictionary. Specified reference works (e.g., the Official Tournament and Club Word List, the Official Scrabble Players Dictionary) provide a list of officially permissible words. The game is played by two to four players on a square board with a 15x15 grid of cells (individually known as "squares"), each of which accommodates a single letter tile. In official club and tournament games, play is between two players or, occasionally, between two teams each of which collaborates on a single rack. The name of the game spelled out in game tiles from the English-language version. Each tile is marked with their point value, with a blank tile - the game's equivalent of a wild card - played as the word's first letter. The blank tile is worth zero points. Tiles are usually made of wood or plastic and are 19 by 19 millimetres (0.75 in x 0.75 in) square and 4 mm (0.16 in) thick, making them slightly smaller than the squares on the board. Only the rosewood tiles of the deluxe edition varies the width up to 2 mm (0.08 in) for different letters. Travelling versions of the game often have smaller tiles (e.g. 13 mm x 13 mm (0.51 in x 0.51 in)); sometimes they are magnetic to keep them in place. The capital letter is printed in black at the centre of the tile face and the letter's point value printed in a smaller font at the bottom right corner. In 1938, American architect Alfred Mosher Butts created the game as a variation on an earlier word game he invented called Lexiko. The two games had the same set of letter tiles, whose distributions and point values Butts worked out by performing a frequency analysis of letters from various sources, including The New York Times. The new game, which he called "Criss-Crosswords," added the 15x15 gameboard and the crossword-style game play. He manufactured a few sets himself, but was not successful in selling the game to any major game manufacturers of the day. In 1948, James Brunot, a resident of Newtown, Connecticut - and one of the few owners of the original Criss-Crosswords game - bought the rights to manufacture the game in exchange for granting Butts a royalty on every unit sold. 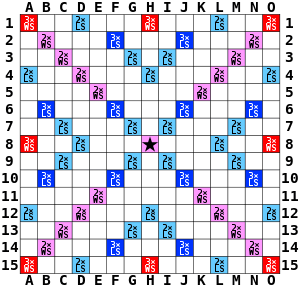 Though he left most of the game (including the distribution of letters) unchanged, Brunot slightly rearranged the "premium" squares of the board and simplified the rules; he also changed the name of the game to "Scrabble", a real word which means "to scratch frantically". In 1949, Brunot and his family made sets in a converted former schoolhouse in Dodgingtown, a section of Newtown. They made 2,400 sets that year, but lost money. According to legend, Scrabble '​s big break came in 1952 when Jack Straus, president of Macy's, played the game on vacation. Upon returning from vacation, he was surprised to find that his store did not carry the game. He placed a large order and within a year, "everyone had to have one." If a player makes a play where the main word covers two DWS squares, the value of that word is doubled, then redoubled (i.e. 4x the word value). Similarly, if the main word covers two TWS squares, the value of that word is tripled, then retripled (9x the word value). Such plays are often referred to as "double-doubles" and "triple-triples" respectively. It is theoretically possible to achieve a play covering three TWS squares (a 27x word score), although this is extremely improbable without constructive setup and collaboration. Plays covering a DWS and a TWS simultaneously (6x the word value, or 18x if a DWS and two TWS squares are covered) are only possible if a player misses the center star on the first turn, and the play goes unchallenged (this is valid under North American tournament rules). Suppose Player 1 plays QUANT 8D, with the Q on a DLS and T on the center star. The score for this play would be (2 x 10 + 1 + 1 + 1 + 1) x 2 = 48 (following the order of operations). Player 2 extends the play to ALI(QUANT) 8A with the A on the TWS at 8A. The score for this play would be (1 + 1 + 1 + 10 + 1 + 1 + 1 + 1) x 3 = 51. Note that the Q is not doubled for this play. Player 1 has DDIIIOO and plays OIDIOID 9G. The score for the word OIDIOID would be (2 x 1 + 1 + 2 x 2 + 1 + 1 + 1 + 2 x 2) = 14. Additionally, Player 1 formed NO and TI, which score 1 + 2 x 1 = 3 and 1 + 1 = 2 points respectively. Therefore the sum of all the values of the words formed is 14+3+2 = 19. However, this is a seven-letter play, so 50 points are added, resulting in a total score of 69. Player 1 now has a 117-51 lead. Acceptable words are the primary entries in some chosen dictionary, and all of their inflected forms. Words that are hyphenated, capitalized (such as proper nouns), or apostrophized are not allowed, unless they also appear as acceptable entries; JACK is a proper noun, but the word JACK is acceptable because it has other usages as a common noun (automotive, vexillological, etc.) and verb that are acceptable. Acronyms or abbreviations, other than those that have acceptable entries (such as AWOL, RADAR, LASER, and SCUBA) are not allowed. Variant spellings, slang or offensive terms, archaic or obsolete terms, and specialized jargon words are allowed if they meet all other criteria for acceptability; though archaic spellings (e.g. NEEDE for NEED) are generally not allowed. Foreign words are not allowed in the English language Scrabble unless they have been incorporated into the English language - for example, the words PATISSERIE, KILIM, and QI. Vulgar and offensive words are generally excluded from the OSPD4, but are allowed in club and tournament play. "Double Challenge", in which an unsuccessfully challenging player must forfeit the next turn. This penalty governs North American (NASPA-sanctioned) OWL tournament play, and is the standard for North American, Israeli, and Thai clubs. Because loss of a turn generally constitutes the greatest risk for an unsuccessful challenge, it provides the greatest incentive for a player to "bluff", or play a "phony" - a plausible word that they know or suspect to be unacceptable, hoping his or her opponent will not call him on it. Or a player can put down a legal word that appears to be a phony hoping the other player will incorrectly challenge it and lose their turn. The original Scrabble, developed by Electronic Arts and released by Gamehouse Inc. in 2012, was withdrawn from Facebook in May 2013. The decision by Mattel to replace the original version was met with criticism from its user base, many of whom have switched to an alternative. A new licensed product, Super Scrabble, was launched in North America by Winning Moves Games in 2004 under license from Hasbro, with the deluxe version (with turntable and lock-in grid) released in February 2007. A Mattel-licensed product for the rest of the world was released by Tinderbox Games in 2006. This set comprises 200 tiles in slightly modified distribution to the standard set and a 21x21 playing board. High game (OSPD) - 830 by Michael Cresta (Mass. ), at the Lexington (Mass.) club, October 12, 2006. Cresta defeated Wayne Yorra 830-490. High game (OSW) - 793 by Peter Preston (UK), 1999. High game (SOWPODS) - Toh Weibin set a record score of 850 at the Northern Ireland Championships on 21 January 2012. The winning margin of 591 points is also believed to be a record. High combined score (OSPD) - 1320 (830-490) by Michael Cresta and Wayne Yorra, in a Lexington, Mass., club, 2006. High combined score (OSPD) in a tournament game with no phony words played - 1127 (725-402) by Laurie Cohen (Ariz.) and Nigel Peltier (Wash.), in a tournament in Ahwatukee, Arizona, February 16, 2009. High combined score (SOWPODS) - 1210 (721-489) by Edward Okulicz (Australia and Michael McKenna (Australia), at the 2013 Janboree in NSW. Highest losing score (OSPD) - 552 by Stefan Rau (Conn.) to Keith Smith's (Tex.) 582, Round 12 of the 2008 Dallas Open. Highest tie game (OSPD) - 502-502 by John Chew and Zev Kaufman, at a 1997 Toronto Club tournament. Highest tie game (SOWPODS) - 532-532 by Sinatarn Pattanasuwanna (Thailand) and Tawan Paepolsiri (Thailand) at the 2012 World Youth Scrabble Championship. Highest opening move score (SOWPODS) - BEZIQUE 124 by Sam Kantimathi (1993), Joan Rosenthal and Sally Martin. Highest single play (OSPD) - QUIXOTRY 365 by Michael Cresta (Mass. ), 2006. Highest single play (SOWPODS) - CAZIQUES 392 by Karl Khoshnaw. Highest average score, multi-day tournament (OSPD) - 484 by Doug Brockmeier (Calif.) over 12 rounds at Elmhurst, Ill., 2011. 471 by Chris Cree (Tex.) over 18 rounds at the Bayou Bash in Houston, Tex., 2007. Highest average score, multi-day tournament (SOWPODS) - 499.94 by Nigel Richards (MY) over 16 rounds at the 7th Lim Boon Heng Cup, Singapore, 2009. Scarabeo is a variant that is much more popular in Italy than the original game. It features a 17x17 grid of cells and peculiar rules. Production and Marketing Company, 1954 - metal hinged box, Bakelite tiles inlaid with round magnets, chrome tile racks, silver colored plastic bag and cardboard box covered with decorative paper. The box, when opened flat, measures 8½″ x 7¾″ (21.6 x 19.7 cm) and the tiles measure ½″ x ½″ (12.7 x 12.7 mm) each. Spear's Games, 1980s - boxed edition with pegboard, plastic tiles with small feet to fit snugly in the pegboard. Racks are clear plastic, allowing some sorting while holding tiles fairly snugly. Set comes with a drawstring plastic bag to draw tiles and a cardboard box. It is possible to save a game in progress by returning the board to the box. There is risk of players' trays being mixed and upset, and the box lid, held on by friction, is subject to upset. Selchow & Righter, 1980s - pocket edition with plastic "magnetic" board and tiles. Tile racks are also plastic with asymmetrical shape to provide handhold. All elements fit in a plastic envelope for travel and to permit a pause in the game. Plastic letters are very small and tend to lose their grip if not placed with slight lateral movement and if they are not perfectly clean. 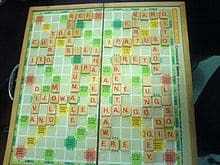 Game format is extremely small, allowing Scrabble games for backpackers and others concerned about weight and size. Hasbro Games, 2001 - hinged plastic board with clear tile-shaped depressions to hold tiles in play. Board is in a black, zippered folio such that board and tiles may be folded for travel, even with game in play. Reverse side of board contains numbered mounts for racks, holding tiles face down, allowing secure and confidential storage of tiles while game is paused. Some versions have tile racks with individual tile slots, thus not permitting easy sorting of tiles in rack. The board, when opened up, measures 24.5 x 21.0 cm, and the tiles are 12.3 x 12.3 x 6.7 mm in size.